The NeckRest has been designed by an expert Australian Olympic Physiotherapist to help you with the relief of neck pain and headaches. The NeckRest can be used to treat neck pain & neck related headaches easily, whenever you need to at any location. To ensure maximum pain relief the NeckRest was designed using technology that involved 3D cervical anatomy research. The dimensions between NeckRest’s patent treatment ridges are the same as the average width between your neck joints. This means that when you lie on the NeckRest, the therapeutic force conveyed via the treatment ridges is applied to your sore joints and uncomfortable neck muscles; providing relief from pain and stiffness. The NeckRest can be adjusted up or down your neck providing relief over different areas. For relief from headaches or upper neck pain, it can be positioned at the base of your skull and upper neck; and can be used for 30-60 seconds daily. 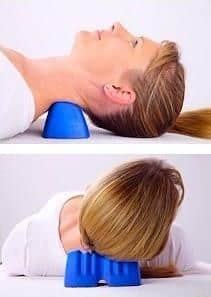 For lower neck pain the NeckRest can be placed at the bottom of your neck, if needed you can rest your head on a pillow to adjust the level of pressure. To relieve problems at the side of your neck, place the NeckRest at the base of your neck and rotate it to the side that needs pain relief. You can purchase the NeckRest at any of Core Physiotherapy and Pilates Studio locations, press here to find a location near you.